Great Lakes Books Series, 9780814338155, 217pp. In the early 1900s, Detroit's clubwomen successfully lobbied for issues like creating playgrounds for children, building public baths, raising the age for child workers, and reforming the school board and city charter. But when they won the vote in 1918, Detroit's clubwomen, both black and white, were eager to incite even greater change. In the 1920s, they fought to influence public policy at the municipal and state level, while contending with partisan politics, city politics, and the media, which often portrayed them as silly and incompetent. 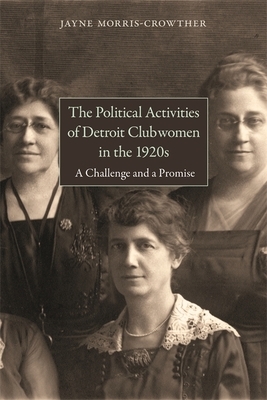 In this fascinating volume, author Jayne Morris-Crowther examines the unique civic engagement of these women who considered their commitment to the city of Detroit both a challenge and a promise. By the 1920s, there were eight African American clubs in the city (Willing Workers, Detroit Study Club, Lydian Association, In As Much Circle of Kings Daughters, Labor of Love Circle of Kings Daughters, West Side Art and Literary Club, Altar Society of the Second Baptist Church, and the Earnest Workers of the Second Baptist Church); in 1921, they joined together under the Detroit Association of Colored Women's Clubs. Nearly 15,000 mostly white clubwomen were represented by the Detroit Federation of Women's Clubs, which was formed in 1895 by the unification of the Detroit Review Club, Twentieth Century Club, Detroit Woman's Club, Woman's Historical Club, Clio Club, Wednesday History Club, Hypathia, and Zatema Club. Morris-Crowther begins by investigating the roots of the clubs in pre-suffrage Detroit and charts their growing power. She goes on to consider the women's work in three areas-Policies That Affect Women and Children, Protecting the Home against Enemies, and Home as Part of the Urban Environment-and considers the numerous challenges they faced in The Limits of Enfranchised Citizens. An appendix contains the 1926 Directory of the Detroit Federation of Women's Clubs. In the end, Morris-Crowther shows that Detroit's clubwomen pioneered new lobbying techniques like personal interviews, and used political education in savvy ways to bring politics to the community level. This volume will be interesting reading for enthusiasts of Detroit history and readers wanting to learn more about women and politics of the 1920s. Jayne Morris-Crowther is an adjunct in the history departments of the University of Delaware, Rowan University, and Neumann University. Her articles have been published in the Michigan Historical Review and the South Carolina Historical Magazine.